Together we can make a greater impact! What is the Pledge to Partner? 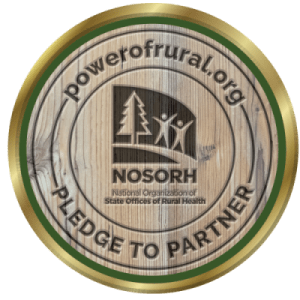 The Pledge to Partner was designed to help us strategically align with people like you who want to achieve higher performance and visibility, optimize our collective contributions, and realize complementary objectives that advance the rural health mission. We are transforming NRHD into an ongoing commitment to bring collective focus to specific healthcare issues facing rural communities across the United States. We’re inviting all rural health stakeholders to inspire communities across the country to address and resolve their most challenging population health issues. We need you to make a promise to stay informed and involved with NOSORH and SORHs all year long, helping to support their combined missions. Stay connected with NOSORH and SORHs throughout the year. Inform those entering the healthcare workforce about the great and fulfilling opportunities to care for rural communities. Engage partners from non-healthcare industries to help create additional solutions to prevailing challenges.